The American Academy of Pediatrics recommends starting babies on solid food around 6 months old. What are signs my baby is ready for solid foods? What can my baby eat? Start spoon feeding baby with a variety of thinly pureed fruits and vegetables, such as bananas, peaches, and squash, and single-grain cereals mixed with breast milk or formula. Every time you introduce an unfamiliar baby food, wait a few days before trying anything new. That way, if your baby has an allergic reaction, you’ll know the culprit. Remember to continue providing breast milk or formula until their first birthday. Solid foods alone do not meet all of a baby’s nutritional needs during the early stages of feeding development. What can’t my baby eat? For the first year, avoid feeding your baby cow’s milk, honey, salt, and artificial sweeteners. Their digestive system cannot process cow’s milk, and honey contains spores that may lead to infant botulism. 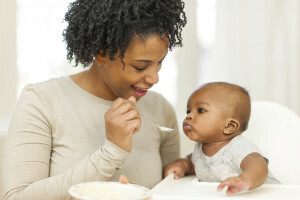 How do I start feeding my baby solid foods? Here are a few strategies to make the transition to solids a little easier. Wait until your baby is in a comfortable state before introducing anything new. They’ll be more open to new experiences if they aren’t tired, crabby, or sick. Give your baby a small amount of breast milk or formula before offering their first solids. If they’re too hungry, they’ll get frustrated; if they’re too full, they won’t be interested. Do not force any kind of food. If your baby rejects a food, simply wait a few days and try it again. If you suspect your baby is a picky eater or has a feeding problem, call your healthcare provider to discuss feeding milestones and schedule an office visit. Want more information about feeding? Babies tongue tie may have feeding difficulties. Learn what tongue tie is and what you can do to help. 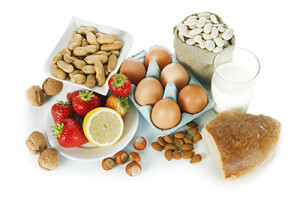 Find information about food allergies and theories about why there has been an increase in recent years.